Bus from Cameron Highlands to Ipoh is the most frequent bus service in Cameron Highlands Bus Terminal. It serves not just locals but also the tourists travelling between Cameron Highlands and Ipoh. 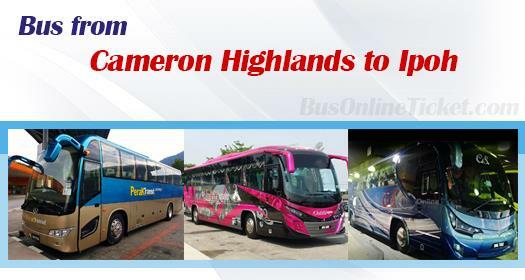 Perak Transit, Unititi Express, CS Travel are the three operators serving bus Cameron Highlands to Ipoh. Perak transit supplies the most numbers of schedules among them by having 7 departures daily. Kindly note that the bus service from Cameron Highland to Ipoh starts as early as 08:00 and the last departure time is at 18:00 evening. The journey for bus Cameron Highlands to Ipoh takes about 2 hours to meander through the winding road which is full mountain view. Kindly note that there is NO stopover during the journey. Passengers are advised to ease yourself before the start of the journey. The fare for bus Cameron Highlands to Ipoh is reasonably charged at RM 20.00 per ticket. Passengers who have motion sickness are advised to prepare a plastic bag and motion sickness pills. All coaches are leaving from Tanah Rata bus terminal. However, Unititi Express and CS Travel provides additional pick up point from their respective tourist information centres located at the start of Tanah Rata Main Street. The arrival terminal in Ipoh is at Aman Jaya Bus Terminal. Passengers could take the frequent city bus to Ipoh town at cost of RM2 only. BusOnlineTicket.com is the ticketing portal which offers online booking service with instant confirmation and seat selection feature. Therefore, it is convenient for passengers to book ticket in advance to secure the transport before the journey.